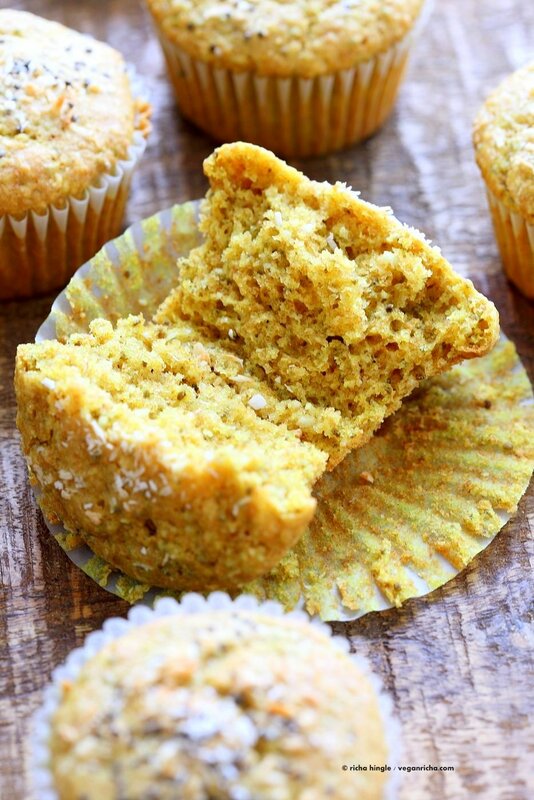 Lemon Coconut Chia Muffins. 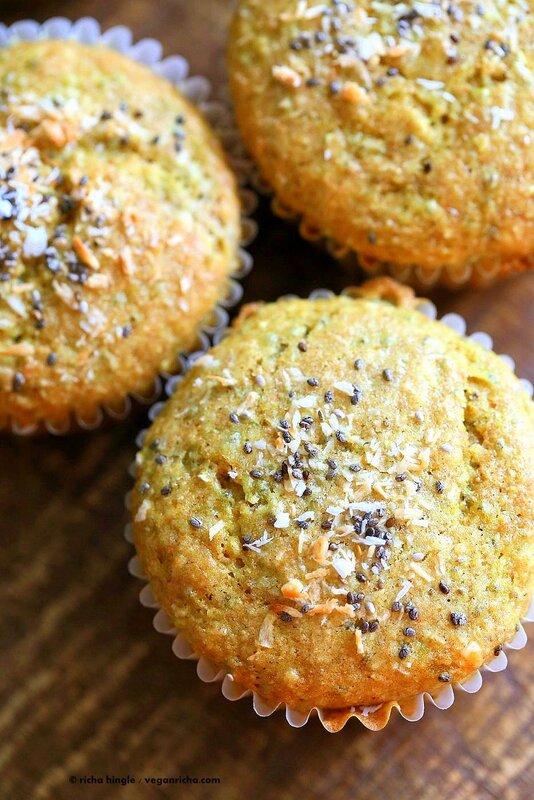 Zesty Muffins with Lemon, chia seeds, coconut and Turmeric. 1 bowl 30 minute Lemon Chia Muffins. Vegan Soy-free Nut-free Oil-free Recipe. Pin this for later. When I made the lemon coconut curd chia pudding, I knew I would want those flavors and texture in other ways as well. Something that I can carry around, something that was not as filled with chia seeds as a chia pudding. Hence, these muffins! 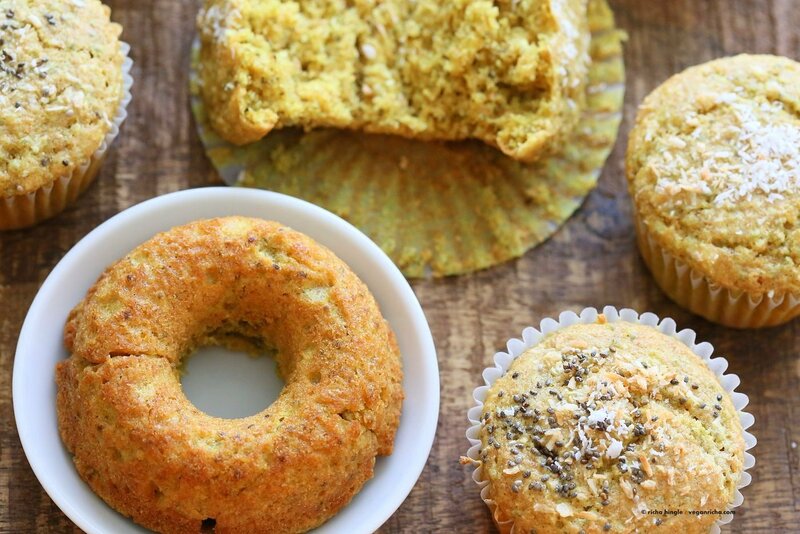 These zesty moist muffins have no added oil. The full fat coconut milk makes them soft and amazing. Loads of lemon zest, lemon juice, chia seeds and some turmeric for color. Add other flavors of choice like vanilla, add chopped nuts or dried fruits, bake and done! I dressed these with a bit of coconut flakes and a sprinkle of chia. These muffins are fresh and summery and make a great breakfast or snack. You can also use the batter to make doughnuts! Pipe into a greased doughnut pan and bake. To make these muffins gluten-free, use the flours from my gf banana nut muffins. More baked Breakfast options from the blog. Mix all the wet ingredients until sugar is well combined. Refrigerate for at least an hour to hydrate the chia seeds. I usually keep it overnight. Line a muffin pan with muffin liners.Preheat the oven to 350 degrees F.
In a bowl, whisk all the dry ingredients. Add to the wet and mix to combine. The batter should be somewhat flowy but not runny. If too runny, add a few tbsp more flour and mix in. (If the wet mixture was refrigerated overnight, the batter will be thick and muffin like and not flowy). Add more turmeric if needed. Fold in dried fruit or nuts, candied lemon or blueberries at this point. Drop the batter into lined muffin pan. Sprinkle coconut and chia seeds on top. Bake at 350 degrees F / 170ºc for 26 to 28 minutes. Cool for 5 minutes in the pan then a few minutes on the counter before serving. The muffins can be kept on the counter (covered) for upto 2 days, or refrigerated upto 5. To make these gluten-free: Use a gluten-free blend of choice or a mix of 2/3 cup almond flour, 1/3 cup rice flour, 1/3 cup oat flour or other gluten-free grain flour, and 3 tbsp potato starch/tapioca starch. These muffins look so fluffy, thick and delicious! The coconut milk probably lends that thick texture! you can make these with other sweeteners like stevia. You need some sweet else they will be bland. If I used maple syrup, would I use less coconut milk? Yes,the sugar amount got to me as well. These look delicious. Lemon is my favorite flavor. I wonder how they’d work with all white ww flour. I may try. I’m lazy, and would rather use all one flour (and would like them all whole grain). they should work fine. Sometimes all whole grain gets too dense and affects the overall texture and flavor, so i use a bit of unbleached white or 1-2 tbsp cornstarch to balance that out. Do you use coconut milk from a tin or coconut milk from a carton that you usually have in or as a drink? Hi Richa! Me again 🙂 you know what I’m going to ask you right? Lol. Can I make this gluten free? If so, how. It looks delicious, I can’t wait!! Thank you so much. See info below the second picture. I mention how to make them gf. But that’s a different recipe?yes, gluten free but different recipe. Sorry, I’m a novice baker lol. I’m making your chickpeas with tumeric and peanut butter sauce right now..again!! Yum. 1/4 cup starch (2 tbsp tapioca starch and 2 tbsp potato starch). to replace the flours in the recipe. By full fat coconut milk, do you mean those that we find in a can rather than those in carton boxes? Yes preferably from a can. some carton boxes also have full fat coconut milk. What an amazing flavor combo! Sounds delicious! I made these last night and they are my favourite muffins I’ve made to date! And no oil too! Absolutely delicious and fluffy and zesty. Perfect. Thanks for the review! I’m making them tomorrow! These look so tasty, how many muffins does this recipe make in total? I made them this morning and we absolutely love them! My son (3) ate 4 and he said they are delicious ???? I’ll make them again for sure next weekend! just made them and couldn’t resist eating two straight from the oven. I used stevia and a little maple sirup as well as gf flour. Made these today, and they are so tasty! I followed the recipe exactly and added in dried blueberries. Thank you! 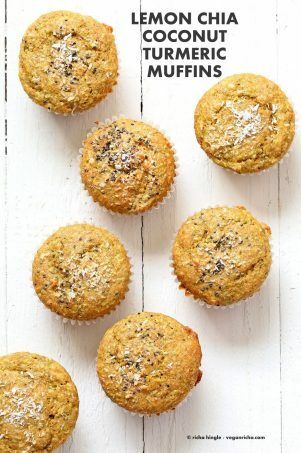 These muffins changed my life because I love lemon poppyseed muffins! So you guys know — I couldn’t find full fat coconut milk so one time I added some earth balance, they turned out perfect. The next time I added a tablespoon of coconut oil, they also turned out perfect. The only problem with these is that in a household full of people, they won’t last long. Wonderful, Richa! I made those muffins, they are fabulous. My first vegan muffin, a great success. My kid’s favourite muffin! I made them with buckwheat flour instead of white/wheat flour and a bit less sugar. Worked great. I used coconut cream, maybe I should have used an ordinary coconut milk, just not the light version. Will try with stevia leaves and berries as suggested! Thanks so much!! These are amazing and so easy. I love the lemon and coconut flavour!! Hello, how many muffins does this recipe make? can i use almond milk instead?? almond Milk will not thicken as much and will be quite runny. Maybe use 1 tbsp coconut oil in it along with almond milk, or add more chia seeds. I just made the muffins with unsweetened soy milk + 2 tbsp of olive oil and they turned out great! Could I use spelt flour instead? I don’t like the flavor of whole wheat. Thanks – They look yummy ???? One more question…. just the milk or should also include the water at bottom of can? full fat coconut milk will often separate into cream and water like liquid. use the entire can. if the recipe calls for coconut cream, then use the separated white part only. the watery part can be used a light coconut milk in curries, sauces or baking. Hi, haven’t made this yet, but sounds delicious & you haven’t steered me wrong so far! ???? Muffins go pretty quickly in my house as well and I’m wondering if these freeze well?? Thank you, LOVE your recipes! Hi I made your delicious pudding –what would the total wet measurement (of the pudding–how many cups?) be to add to the dry to make these? Thank you so much!! You would need all of the pudding from the recipe. If the batter is too runny, add 1 -2 tbsp more flour. You will need to add some sweetener to the pudding before mixing the dry. About 1/2 cup sugar. For the turmeric, should I use dried turmeric or fresh grated turmeric? You never disappoint vegan Richa!!! You are my all time, everytime go to to recipe vegan guru!!! Love you!!! I LOVED these muffins and could see myself eating them regularly! The chia seeds really make the muffins ‘springy’. I made a few changes and thought I’d share: (1) almond/coconut carton milk blend + small amount of Earth Balance (next time may add coconut oil instead); (2) almond flour instead of all purpose flour. (3) meyor lemon instead of regular lemon & lemon extract instead of lemon zest (could still use more lemon in my opinion). (4) coconut sugar (lowest amount specified) instead of sugar. The coconut sugar makes the muffin darker in color but it’s still good. Also, this muffin is best for breakfast the next morning, as it sticks to much to wrapper after it comes out of the oven. Enjoy!!! Made these tonight as directed, turned out ok. I think maybe I’ve just eaten too much full fat coconut milk recently. I think I would have liked them better with regular coconut milk, not from a can. Oh well maybe next time. Maybe use other non dairy milks such as almond or soy and reduce the shredded coconut. that will make them more neutral + lemon flavor. It could be extra lemon or needing a longer bake time. The lemon juice should be about 1/4 to 1/3 cup total. With extra moisture, the bake time increases a bit too. Well they gummy overall on the edges as well or more so towards the inside. They were gummy all over, so don’t think it was pure bake time. The edges were quite brown. Will try again and measure out lemon juice..maybe was just a bad batch and next ones will be better! If I wanted to make these into mini muffins, could you speak to how this would change bake time? i’d check at 17 or 18 minute mark if they are done. I made these for my son’s first birthday party and they were fantastic! I did half of the batter as mini-muffins to freeze (which I then sent to daycare to have with breakfast) and then I turned the others into cupcakes by drizzling a little lemon glaze over the top (sort of ruined the health-factor, but they were cupcakes!). I also may have had a heavy hand with the lemon because we all love lemon flavor. Very yummy, though – thank you! I made these last night and they were fantastic! I accidentally used the whole can of coconut milk and didn’t add any extra flour, and they were still great! Can i use full cream milk instead of the coconut milk ? If i use milk and milk should i had the lime juice n lime zest n soak with the chia seeds ? Thank you Bindya. These muffins are written for coconut milk. I dont know if that an be substituted. I wouldnt recommend substituting it anyways since we do not support using dairy for ethical reason. the muffins taste great, however they are very sticky to the paper liners. Could this be due to the fact that I substituted almond milk and olive oil for the coconut milk and used gluten free flour? Could be the flour or could be that the liners are old. old liners get really sticky. Let the muffins sit for an hour or so and the moisture will help them less sticky. You can also grease the liners before pouring the batter to help. These are amazing! I baked for 25 mins and they came out perfect. I don’t usually refrigerate batters overnight but glad I did this time… the lemon curd (wet batter) was delicious too. Next time I make the muffins I will add a little more lemon juice/zest and a little more than 1/2 cup sugar. These could easily be glazed and served as dessert too. Really impressed with the recipe. These were excellent. So moist and delicious. I used low fat coconut milk because that is what I had, plus one tablespoon of oil. And added the zest from both lemons – I figured if I’m using the juice of two, might as well use all the zest too! The lemon coconut flavour is perfect. Five stars! I stumbled across your recipe today whilst searching for a muffin recipe for chia seeds and just wanted to thank you as they turned out really well, The only change I made was to use the zest from both lemons. My muffins came out flat. Almost caving in. I usually don’t use liners, just non stick spray. So they totally just stuck to the pan. I had to chisel them out. But, from what i could salvage they came out way to delicious not to try again. Please help! hmm maybe the batter was too wet and needed more flour or the muffins needed more bake time. Was the batter too thin? were the muffins fully cooked? if the batter was thin, just add a bit more flour until it is a flowy batter but thick enough to coat a spoon well. if the muffins were not cooked fully in the middle then they just needed more baking time. The uncooked batter might make them sink. What can I use instead of tumeric? I am loving your new cookbook Everyday Kitchen! I recently made these muffins and they were delicious! The combination of flavors was wonderful and I will definitely make them again. I appreciate how easy to follow your recipes are and they never disappoint. Is the cane/raw sugar liquid? Can I use some other sugar which is not liquid or is that not recommended? its dry. Any dry sugar will work. Oh right. Sorry, I somehow thought it has to be liquid, since it was listed under wet ingredients. But thanks for the quick reply. Can’t wait to make them! I made these plain/as written above and loved them. I’d like to make again this week with frozen blueberries. How much do you recommend? Thank you! We re-tested this recipe for various amounts for the book and this is why the discepency. Both should work. My daughter was so excited about these! She asked if there were REAL lemons in them 🙂 I used frozen blueberries and whole spelt flour, there was just enough batter for the 12 cups and they didn’t rise much. Maybe the amount of lemon juice was off – I used two lemons but size and juiciness tends to vary. Also I was inpatient and did not rest it overnight 🙂 She ate 3 at once. Is it possible to substitute poppy seeds instead of the chia seeds? yes. you might need a bit more flour to make a thick batter as poppy seeds dont absorb moisture like chia seeds. My guess it was the protein powder or they needed more baking time. I had them in the oven for 28 minutes, but maybe the protein powder needs longer baking time? Would love to hear your thoughts! yes the protein powder probbly dint absorb the moisture. You want the batter thick enough as the extra moisture will cause the muffin to fall. If it falls, it will be gummy as the air that was there is now squished out. with the added protein powder, i think you want the batter to be pretty stiff.